6) Bhuvanesware B. G. (Bhuvana). Ambuja loves to dance, sing, listen, talk, imagine, act, narrate, create, write, and spread healthy happiness. Her search for an avenue to nurture all her ‘loves’ found an answer when she stumbled upon the fantastic art of storytelling. Training from Dr Eric Miller of the World Storytelling Institute polished her skills and helped her to discover the storyteller and trainer in her. She found her ‘Calling’! Questions answered! Passion identified! That’s the story of how an IT professional with a decade of experience in the field became a storyteller with the primary mission of spreading healthy happiness! Ambuja performs at various schools and social gatherings. Her S-camps at Ramapuram are packages of stories, slokas, public speaking and theatre. A stern believer in knowledge sharing, she conducts workshops for children and adults on storytelling, public speaking, and related skills. Ambuja's storytelling has been broadcast by All India Radio. She has been featured in DD Podhigai TV's "Illakkiya Durbar" program multiple times. She was interviewed for this station's national "Kaalai Thendral" ("Morning Breeze") program in its "Nam Virundhinar" (Our Guest) segment -- a recording of the live telecast of this interview is here. She was also invited as a guest for their live Thamizh quiz show, 'Zhagaram' -- a recording of the stories she shared in this segment is here. Alvin is a Storyteller and Creativity Trainer. He seeks to deliver Peace, Joy, and Goodness through stories, and also to help individuals discover the knowledge of their true selves, and identify their inborn potentials. Alvin's Storytelling and Training Company is Regina Pacis - Zone of Confidence. Regina Pacis trains Teachers regarding Storytelling, Communication, and Personality Development. Alvin also teaches Spoken English classes for students and professionals. Alvin has developed a 2-week Personality Development module called "LIKES" (Life Inspiring Knowledge Enriching Stories) for people of the age group 12 to 17 years. If you might be interested to have this module in your institution, please contact Alvin. 3) to encourage children to develop reading and writing habits. Anusha is the founder and director of Once Upon a Time. She conducts storytelling sessions on weekends in Ashok Nagar and Royapettah. Her summer camp storytelling sessions this past April and May were very popular. A photo of Anusha telling a story is here. Anusha also holds a Masters degree in Psychology. Facebook, Anusha Ramasamy's Once Upon a Time . Asha is a Storyteller, and is the founder-director of Tale Spin. She gives storytelling performances covering a wide range of themes, to suit all occasions and age groups. She also leads and arranges Storytelling Workshops (potentially featuring multiple trainers) on various aspects of storytelling. Banumathy is the founder-director of Fables N Tales in Perumalagaram (near Tiruverkadu). She has been a Professional Storyteller and Trainer for the past 6 years. Banumathy gives Storytelling performances for all occasions and age groups. She has done over 300 sessions of Storytelling and Training in: Fables n Tales (Weekend Storytelling Sessions), Storytelling Festivals, DD Pothigai TV Channel, Suriyan FM, All India Radio (English and Tamil), Summer Camps (Tirupur, Erode, and Bangalore), Schools, Colleges, Govt. Libraries, Activity Centers, Corporates, and Family Events. Banumathy trains adults and teachers on methods of Storytelling. A) Saturdays, 10:30am to 12 Noon, in Tiruverkadu. B) Saturdays, 4pm to 5:30pm, in Anna Nagar. C) Sundays, 10:30am to 11:30am, in Tiruverkadu. Details about these sessions are here. Video of a performance in Chennai Storyteling Festival 2018. Bhuvana works with storytelling in a number of ways. She is a storytelling Trainer and Coach for parents, teachers, and other professionals -- helping them to develop their own storytelling, and also helping them to conduct storytelling activities with children. She designs theme-based Storytelling Camps for children on topics such as Environment Conservation, and Life Skills. A photo of Bhuvana in a Storytelling discussion session with children is here. In addition, Bhuvana is the founder-director of Let's Talk, a counselling organisation. Bhuvana is a Psychologist and an Arts-based Therapy Practitioner. When working with children, she uses Storytelling and other arts as therapeutic tools. Daniel uses Storytelling to teach English language. He is a certified TESOL instructor. Together with his wife, Christina, he directs the Virginia Academy of Training and Development Pvt Ltd (VATD), which is based in Pallavaram (just south of Chennai airport). VATD provides English Language training to a number of schools, including Shikshaa Matriculation Hr. Sec. School, in Hasthinapuram (near Chromepet). VATD conducts the English as a Second Language (ESL) program there for 800 students, using innovative and creative fun-filled activities such as Storytelling, Theatre, Mime, Puppetry, and Arts and Crafts, to help children develop their language abilities. Two excellent Storytelling and Language trainers -- Maria Lincoln and Sabatina Cornielle -- add to the strength of the VATD team. Debjani enjoys telling stories, and also giving instruction in Storytelling, to people of all ages. She brings a lot of humor and fun to her Storytelling work. Debjani is a post-graduate in English literature. She has taught in a college in Bangalore; and in Bala Vidya Mandir, Gandhinagar, Chennai. Currently she is conducting phonics classes for children in Besant Nagar and Thiruvanmiyur. 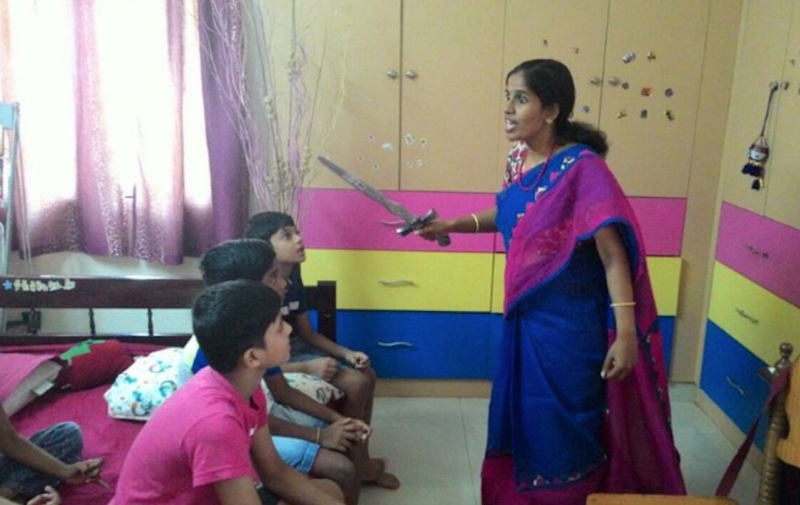 She also teaches communication skills and story-theatre classes for teenagers and adults in Adyar and Thiruvanmiyur. 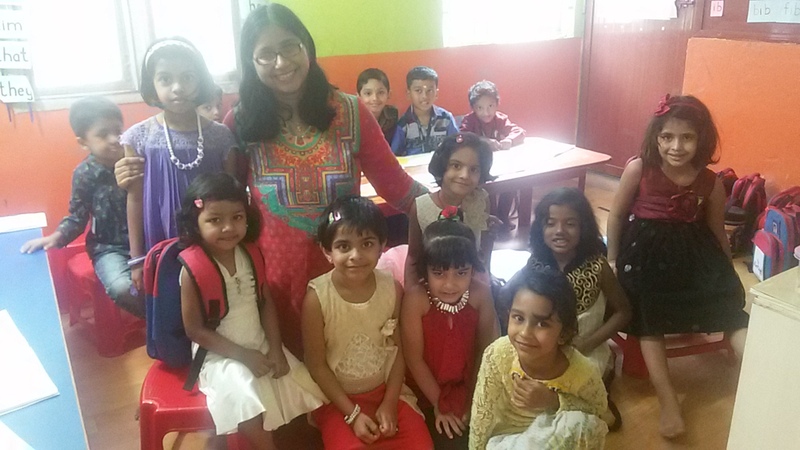 Divya finds great passion in her craft as a storyteller for young children. She has been in the IT industry for a while, alongside which she has also been doing voice-overs for promos, corporate videos, documentaries, and the like. She employs a great deal of voice modulation to give flight to the characters and bring the stories alive. Her stories entertain, and in the process also cultivate a sense of being grounded with healthy beliefs and value systems. Dr Eric Miller (PhD in Folklore). Eric co-founded and directs the World Storytelling Institute. He facilitates the Chennai Storytelling Association; and is a co-facilitator of the Indian Storytelling Network. He conducts storytelling workshops for adults and children, and provides Storytellers for any occasion (in Tamil, English, and other languages). He is helping to develop Storytelling Therapy through Chennai's East West Center for Counselling and Training (of which he is the Assistant Director). Geetha is a Storyteller and Writer. She conducts storytelling and theatre classes for children and adults, especially in Besant Nagar. Geetha is is also a Certified Accountant by qualification, and passionately teaches Accounts and Commerce to students in the 11th and 12th Standards. Indu is a professional storyteller, trainer and content developer. She believes deeply in the magic of storytelling as a medium to engage with people. Personal-experience storytelling is the type of storytelling she most enjoys and considers her forte. She has trained under Jeeva Raghunath. Indu has conducted storytelling workshops and has staged public performances for children. In addition to regular workshops, The Narrative organises Live Themed Personal Storytelling Sessions for mature audiences, once a month. JeyaShivani is a keen orator, debater, and dramatist. A business administrator by profession, she holds a Bachelor of Engineering degree, and a Master of Business Administration degree. JeyaShivani has always used stories to motivate herself in life. But when she won the Chennai Storytelling Festival's "Storytelling Contest for Adults at Cafe Coffee Day" in 2018, that was the call for her to become a storyteller. 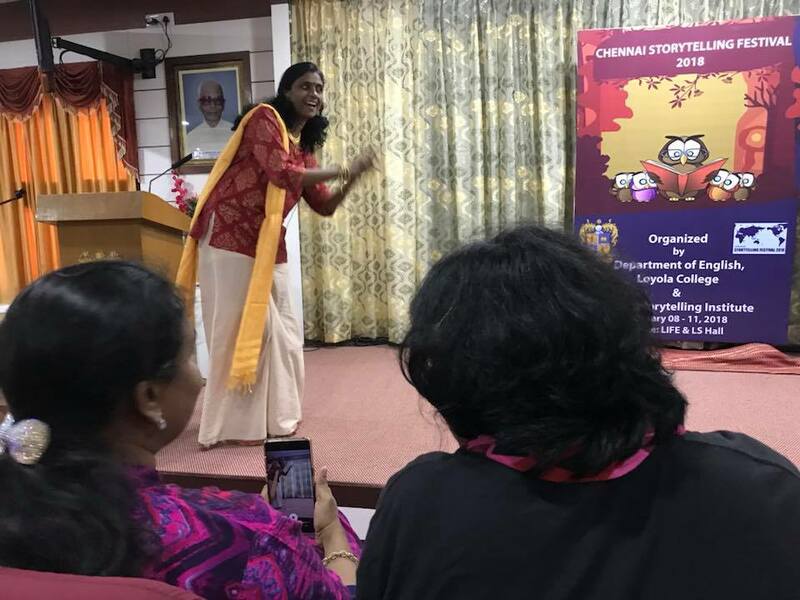 JeyaShivani attended a two-month Storytelling Workshop at World Storytelling Institute, Chennai. 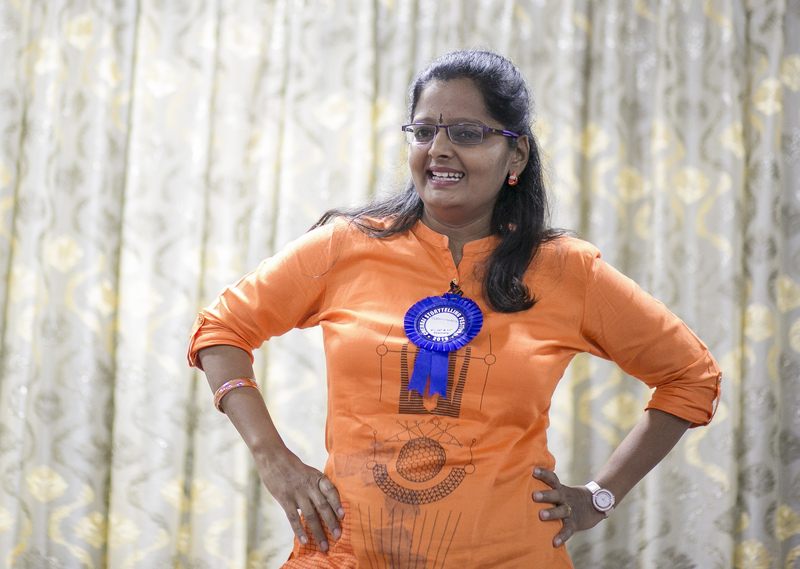 She has been an active member of Chennai's storytelling community since mid-2017. She has started performing at events, open mics, and schools. She performed at Chennai Storytelling Festival 2019, and has also told stories at Story Corner at Bookmine (organized by Madras Story Works). JeyaShivani firmly believes that stories should not be limited to certain age groups. Thus, she has engaged herself in sharing stories with both children and adults and is looking forward to exploring storytelling further, involving various cultures and ideas, and also to applying storytelling's communication techniques to different art forms. JeyaShivani tells in English and Tamil. A video recording of her telling a story in Tamil is here. Kanaga is the founder-director of the storytelling organisation, Alabanza. She is a teacher by profession, and has worked with children in the classroom for many years. She is a certified trainer of Montessori kindergarten teachers. She is also a language instructor, regarding the Spanish language especially. She has attended an English Language Course at the British Council, and has passed the "Test of English as a Foreign Language Exam" (TOEFL). Kanaga is an experienced Storyteller and mono-dramatist. She is an enthusiastic, creative, and imaginative person, and is well able to use her acting skills to express feelings. She has attended a "Seven-session Storytelling Workshop" and a "Workshop on Storytelling for Personality Development" at the World Storytelling Institute. Kanaga has also completed introductory courses in Neuro Linguistic Programming, and in Storytelling (at Kathalaya). Kanaga can combine, in customised workshops, instruction / training in languages and other subjects (including storytelling and mono-drama) -- for children, teens, and adults. Kanupriya is a Storyteller, and trains others to be Storytellers also. She specialises in Storytelling with Puppetry and other Arts and Crafts. Kavitha is a storyteller and founder of Once Upon a Time ... Tells a Tale. She enjoys telling interactive stories to young children between the ages of 3 and 10 years. She has given storytelling performances in many activity centres, such as Chennai Hippocampus, Oyster Kids, and Kart Wheel; at Odyssey book store; and for some leading schools. She includes art and craft work in her sessions. Kavitha conducts regular storytelling sessions at her space in RA Puram - Kavitha's Storytelling Space ! Lavanya is a Storyteller, Trainer, Author, and Translator. She is the founder-director of Katha Kamamishu, A World of Stories. As a Soft-skills Trainer, Lavanya is certified by Jawaharlal Nehru Technological University, Hyderabad. She conducts Activity-based Storytelling Workshops for children and adults, in Classrooms, Colleges, and Corporate settings. She uses Storytelling as a powerful tool for Effective Communication, Ensuring Employability, and Enriching Human Lives; for Enabling Personal Success, Self Confidence, and Self Expression; for Language Learning and Cross-cultural Trainings; and for helping people to develop Creativity in general, as well as in fields such as Music, Dance, Literature, and Advertising and Branding. Her Storytelling Workshops are educational, enriching, entertaining, and empowering. Additional info about Katha Kamamishu is here. 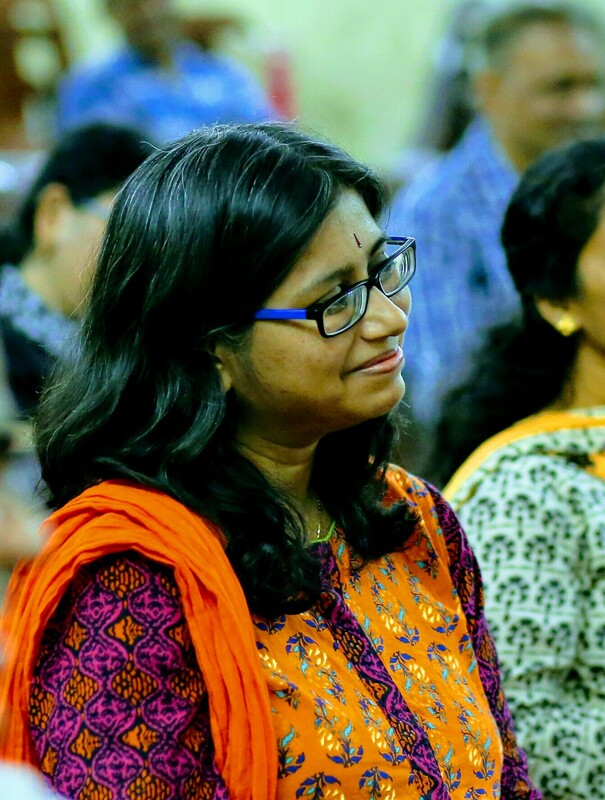 Manjula is a Software Developer turned Storyteller. She enjoys telling stories to children. She is inspired by the various storytelling sessions she has attended in the USA. She includes singing, puppetry, and arts and crafts, along with storytelling. She conducts storytelling sessions at her space in Jains Green Acres Apartment, in Pallavaram. She also conducts storytelling for special occasions. Manjula focuses on improving the morals, speech, communication, and social skills of children via storytelling. She is a graduate of a seven-session storytelling workshop for adults conducted by Eric Miller, Director, World Storytelling Institute. 1) Storytelling for Children (aged 3-15 years): Fun and Learning. 2) Specialized Storytelling Workshops for Children. d) Teaching Manners and Etiquette. a) Teaching Various Academic Subjects. 4) Preparing Modules for the above-mentioned Workshops, or as per requirement. Telling stories can have a lot to do with strengthening relationships, and this can especially be the case with mothers and their children. This is how Meenakshi is spreading the joy of storytelling through her venture, Samvad. In her earlier avatar, Meenakshi worked with software code but now after being a full time mother, she is happy telling stories. She is very passionate about the stories she tells -- and when she gets time, writes also. She enjoys telling stories to children, teenagers, and adults alike. 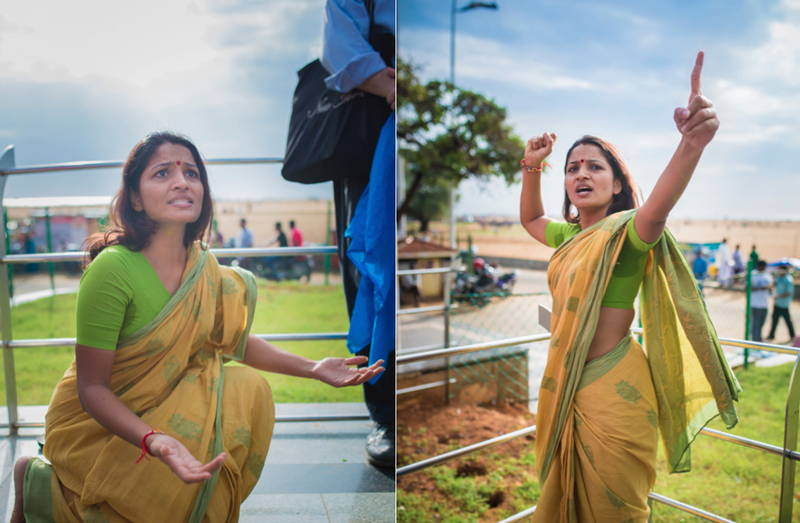 Photos of Storyteller Meenakshi are here and here. Mohan is a Banker turned Storyteller. He was a senior official with the Reserve Bank of India. After his retirement he has taken up storytelling. Mohan has founded Kadhai Kadhaiyaam, a group based in south Chennai that provides storytelling performances and training for children, teenagers, and adults. He founded and curates Madras Tale Spinners, a training ground for budding Storytellers to hone their storytelling skills and make storytelling a financially viable proposition. Mohan is an accomplished Human Resource trainer, and uses storytelling techniques to train people in soft skills, and communication regarding products and services, especially in software and financial services companies. He also utilises storytelling techniques for coaching, mentoring, recruitment, and performance appraisals. Mohan conducts regular storytelling sessions from Indian epics, folklore, and history for inculcating values, and for motivation and inspiration. He conducts storytelling workshops for teachers, Human Resource professionals, parents, grandparents, and young adults. Mohan is fluent in four languages (Tamil, Hindi, Bengali and English). He includes singing, meta-theater concepts, and immersive and experiential storytelling concepts as compelling storytelling techniques. His performances, talks, and workshops synergise elements of entertainment and teaching-and-learning. Mubeen is a very passionate Storyteller. She has told stories at “Storython 2016” (an 8-hour storytelling event), Anna Library, Accenture, and at various other events. She regularly conducts storytelling performance-and-training sessions for children at Swarna Sudarshan Hall, in Kovilambakkam, Chennai. She also conducted these sessions at other locations. In 2016, she gave storytelling training to approximately 500 children. Mubeen releases free audio stories through Whats App every week through her own brand, Story Carpet. She has penned positive rhymes for children: these rhymes have been heard more than 400k times on YouTube within a span of 6 months. She has also penned 30 Rebus stories for children which are also on YouTube. She has published a number of articles in an International acclaimed Magazine. She underwent storytelling training in the World Storytelling Institute with Dr Eric Miller. She is a blogger, public speaker, Emcee, and an ardent Toastmaster. She is also a health geek: you can find her in the yoga studio every day. Mubeen’s primary mission is to infuse positive ripples in the minds of young children through stories. She offers customised classes on Creative Writing, Public Speaking, and Storytelling, for Schools, Colleges, and Corporates. Pandiarajan is a Banker by profession. However, these days he especially enjoys conducting Storytelling Training sessions, for Children and Corporates. He tells and teaches in Tamil and English. Pandiarajan has received training from the World Storytelling Institute, Chennai; and has attended Storytelling events in New York. He was a Facilitator and Trainer for the 2015 and 2016 Chennai Storytelling Contest, including with Udhavum Ullangal (a Charitable Trust based in T Nagar). Nazrin, a B.E. (Bachelor of Engineering) graduate, is a dynamic and enthusiastic person. She is a certified as a "Professional Storyteller" by World Storytelling Institute (based in Chennai). She is also a motivational speaker, has undergone various other Storytelling Workshops, and holds a diploma in Fine Arts. 1) To follow one’s own passion, irrespective of hurdles one might come across. 2) To become more confident. 3) To boost one’s morale. 4) To feel, and connect with, a common humanity. Nazrin customizes sessions of Storytelling, Storytelling-related activities, and Coaching in Storytelling, according to the age group and occasion. Periya Nayaki is a Transpersonal Storyteller, Trainer, and Psychologist. She believes all that is needed for people to live to their complete potential is within them, right here and right now! Periya Nayaki uses stories as a tool to create loving environments with respective personal spaces where the individuals (be they children, youth, or adults) are allowed to explore their higher selves and manifest greater possibilities. She uses metaphors, mythology, folklore, movies, day-to-day events, and personal experiences for stories. Periya Nayaki conducts customized workshops and trainings based on individual requirements in personal settings, and in the virtual space as well. She has worked with many students, teachers, and parents over the years and has learned one sure thing: If love cannot nothing else can and sometimes silence is the best untold story! Pooja combines passion for storytelling, with creativity and entertainment. She engages audience attention with participative narratives, and often intersperses her presentations with interesting activities that enhance listener involvement. Pooja has a rich repertoire of tales and fables from ancient lands of oral tradition such as Africa, China, India, Turkey, Indonesia, and Ukraine. She also composes, and writes and tells her own stories. Pooja has performed in schools, at book stores and birthday parties, and for informal groups. She is the founder-director of Thangam Talkies. She conducts regular programmes at The Storytelling Studio, R A Puram, Chennai. 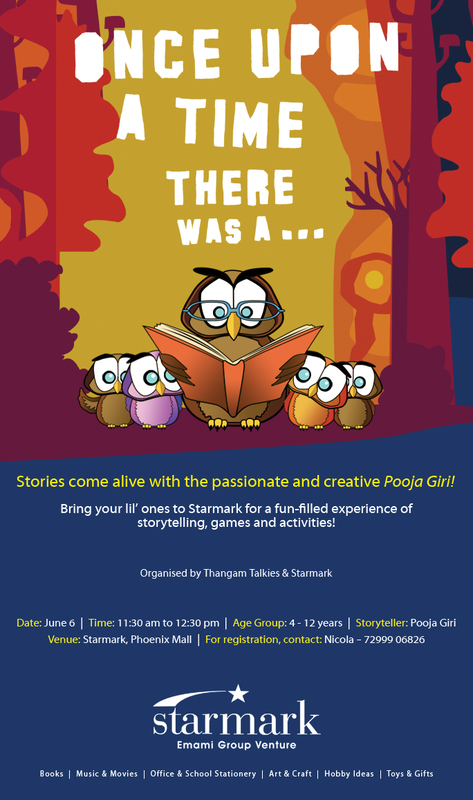 Pooja conductied a Storytelling Session for Children on Saturday 6 June 2015 at Starmark in Phoenix Mall (Velachery). The event poster is here. Pretigaya Haran is a Storyteller and a Trainer of Public Speaking, Communication, and Drama. She conducts weekly Storytelling-theatre workshops for children at iSpark, Goplapuram, in association with the World Storytelling Institute. 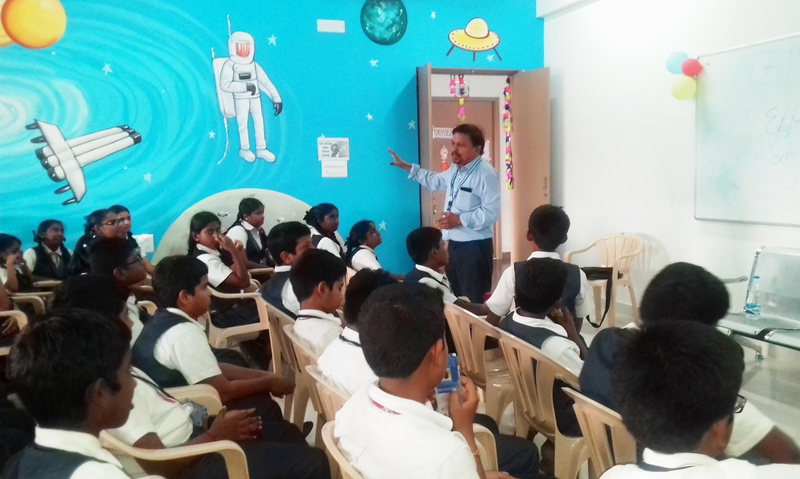 She also conducts weekly Story sessions and Public Speaking classes for middle school children in a school in Chennai. Pretigaya has had the joy of sharing stories at numerous venues, including Schools (Baal Niketan, and Sherwood Hall); Libraries (Anna Centenary Library, and Just Books); Children’s Centres (Buzy Bee, iSpark, Nutshell Kids, and Saaransh); and a Spoken English Centre (Communiqua). Pretigaya also leads Storytelling workshops for adults who use Storytelling as a tool to teach school curriculum, behavioural aspects, and values and morals, to children. She has conducted Teacher-training workshops in schools such as Terapanthi Jain Vidyalaya, KRM Public School, Kalgi Matriculation School, and Sherwood Hall Senior Secondary School. She has also conducted Storytelling workshops for college students and adults in the Chennai Storytelling Festival. Pretigaya has trained children in Speech and Drama at Chennai branches of the Helen O'Grady Drama Academy for over 3 years. She is very keen on drama. She has performed in English, Hindi, Urdu, and Gujarati, in plays in London. For two consecutive years she has performed in the annual "Living Satues of Marina Beach Heritage Walk", an event in Madras Week. Here is a collage of photos of her performing Kannagi (in English) on 23 August 2015. Pretigaya writes and direct skits for children. She has been sharing Jain stories with young children at the Vepery branch of Jain Sanskaar Vatika, an All India School on Jain studies. She also directs the annual day play for them. Pretigaya started Story Sack, Everything Stories in March 2017 to formally give her work a name. She is also part of a project called Springboard Tales, wherein a team of storytellers share monthly, theme-based story videos, available for purchase at their website. Priti is a Storyteller who uses theatre activities to help children improve their communication abilities. She has received training in Storytelling from Geeta Ramanujam, and has received training in Storytelling and Theatre Games from Ms Poppy. She has also participated in the "Kathai Kalatta (Under the Aalamaram) International Storytelling Festival" in Chennai (August 2014), where she learned a lot from the workshops and was a part of the organising team. Priti has told stories to children in Chennai at Hippocampus, Ashivita Bristo, Weebees Play School, Pumpkin Patch, Oyster Kids, and elsewhere. She has led Storytelling Workshops for children at Arsha Vidya Mandir and Harishree Vidyalayam. Priti's Workshops combine Storytelling and Theatre Games. If the workshop is for a week, she prepares the children to enact a skit on the last day. Priti has launched a new storytelling service: Story Voyage -- a unique way to entertain children and adults through storytelling on the move, inside a bus! The bus can carry as many as 24 people. The sesions are interactive, with sing-alongs and games. Participants have memorable experiences of visiting some lovely places in Chennai. Places are recommend depending on the age group. Among the places that have been visited are marine aquariums, lakes, and farms. Story Voyages are arranged for private groups and schools, and typically occur on two Saturdays of every month. Priya has earned an Executive Post Graduate Diploma in Human Resources Management. She has also undergone basic training in NLP. She employs the art of storytelling to teach and train individuals regarding Soft Skills and Communication Skills. She believes in interactive formats of story engineering, interwoven with creativity and spontaneity. Her interest areas include communication strategies, decision making, and gender perspectives. She also uses storytelling to develop social consciousness, in herself and others. Ramya enjoys telling stories to children and believes in enjoying the little things in life. Storytelling turned into her passion when she started exploring the world of stories, as she realised stories delighted her own children from very young ages. She often includes puppetry and arts-and-crafts in her storytelling. She would love to explore art-based storytelling in the coming days, as she enjoys art and considers drawing to be one her strengths. Ramya is an IT professional by career. She has done her Foundation Course on storytelling from Kathalaya, Bangalore. She has also done workshops and hands-on training with Mr. Mohan Krishnan and Mrs. Lavanya Srinivas. Her journey into professional storytelling started along with like-minded friends, and mentor Mohan Krishna. She and two other storytellers have co-founded Kadhai Kadhaiyaam. She has performed storytelling sessions in summer camps, schools, activity centers and libraries. Kadhai Kadhaiyaam conducts regular storytelling sessions and workshops in and around Velachery in schools, activity centers and libraries. Kadhai Kadhaiyaam experiments with different styles of storytelling, such as tandem storytelling and art-based storytelling. Saba is a Storyteller and Trainer. His specialty is purpose-driven storytelling in organizational settings. For him, an anecdote is a story, an example is a story, and a conversation between two people is a story. Saba is a firm believer in the importance of personal stories. There are numerous types of personal stories, suiting all occasions and situations. Saba digs up stories from real-life and makes them palatable for audiences in different age groups. He can also coach others to find, shape, and tell such stories. Saba is also fond of animal stories, especially about squirrels, elephants, and rabbits. Saba maintains a storytelling blog at http://telltaleclub.com , where a number of people contribute stories. He is currently doing research on untold stories in and around Karaikudi and Madurai, and he is planning to publish them as a book. Sai is a Corporate Person by work experience, an Engineer by qualification, and a Trainer by passion. He was a successful professional when he decided to leave his corporate profession and follow his passion of working with people. He started working with people of various ages to train them in Life Skills, Soft Skills, and Behavioral Transformation. As the fundamental medium of training delivery, he chose NLP (Neuro Linguistic Programming), a technique known to influence people and transform them into their best selves. He is a Certified NLP Practitioner, trained under the flagship of Dr Richard Bandler. He has also completed basic training in Transaction Analysis. And he has studied the art of Storytelling under Dr Eric Miller of the World Storytelling Institute. He currently blends these three methodologies to help create the required transformations in the mindsets of people and positively move them to the desired goals. Sai is the Founder and CEO of: Adroit India, a training company working with corporates, colleges and schools; and Sai Pradeep Consulting, a mentoring academy for start ups, students, and individuals in the fields of Business, Education, and Life. Adroit India is a brand that has evolved from Sai's earlier brand of Ekam Training Academy through a binding relationship with Adroit UAE, a leading training company based in UAE. Sai travels around the globe delivering training sessions for children, teens, and adults. Sai has recently also launched Pumpkin Chariot, a storytelling unit for children. Pumpkin Chariot helps children learn a variety of aspects of communication involving values and morals and ranging from conversational speech to stage speech, and from team skills to leadership skills. Pumpkin Chariot has opened its first branch at Sa Buu 3 Kids Play School, Navaneethammal Street, Saligramam. Here he conducts storytelling sessions every Saturday between 11am and 12:30pm. One can drop in directly at the location, or call or e-mail Sai to know more about these sessions. Samatha (sa-ma-tha) is a painter who has also developed an interest in storytelling. She enjoys using personal-experience stories and mythological and grandmother stories to raise awareness and sensitivity about gender issues. She believes storytelling activities can help one to work through challenging situations in one's life, and that sharing stories has a transformational potential for recovering from trauma and for self-development. Samatha performs for, and leads discusions and Storytelling Workshops with, women's groups, corporate groups, and other groups of adults. She won the 2016 Chennai Storytelling Contest (adult English-language section, sponsored by Cafe Coffee Day), and is currently the reigning champion! She is happy to find a welcoming community of Storytellers in Chennai. Samatha runs a Workshop Center and Guest House called Energy Clinic. Her paintings can be seen at www.artofsamatha.wordpress.com and at Madras Square, in Neelankarai. 1) Storytelling performances for children, with associated Art and Craft activities. 2) Storytelling performances for adults, on customised topics. 3) Customized Workshops for any category of people. In workshops for children, the focus is on developing Speech, and Interpersonal Communication and Social Skills. 5) Soft Skills training (improving Interpersonal Skills, etc) for professionals, and for those seeking employment. 6) Translation Services, verbal and written (English to Tamil and Hindi, etc). Selina is a Project Leader turned Storyteller. She uses stories to teach children moral values, shape their attitudes, and encourage their self-confidence and reading and writing skills. She also uses storytelling techniques to train people in soft skills. She is interested in the environment, and conducts storytelling and skits with children on protecting the environment and being aware of the dangers of plastics. She has participated in the “Save Turtle” project, including by developing original stories on the topic. Selina has undergone storytelling training in the World Storytelling Institute with Dr Eric Miller. On weekends, she leads storytelling sessions titled, “Tales for All”. Shan directs Artworkshop & Communication, which provides training in Storytelling, utilizing Storytelling to teach and learn curriculum (lessons), creating Character Puppets, and presentations. He specializes in training students in Mind Mapping, Learning Techniques, and Mind Games. 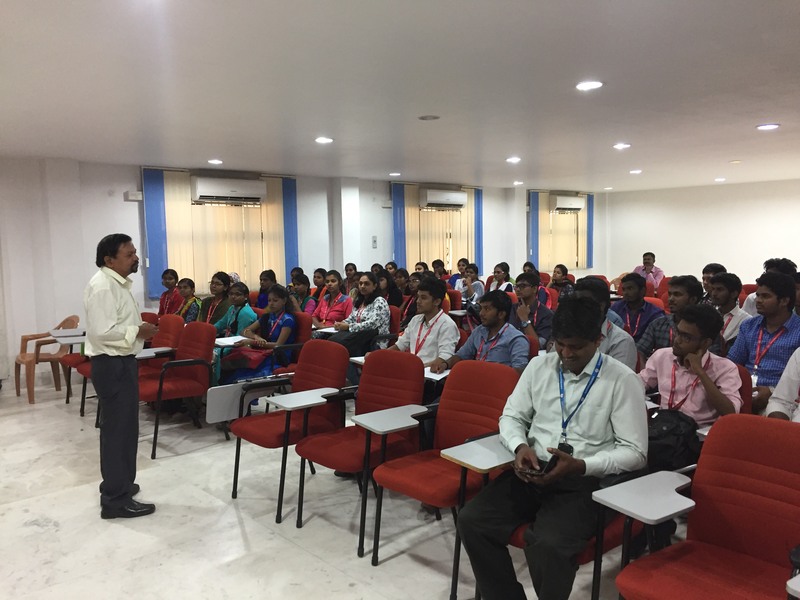 He has trained over 10,000 students in Chennai and elsewhere in Tamil Nadu. 1) A Trainer in Soft Skills and Life Skills (NLP) Programs for Schools and Colleges. 2) A Consultant and Workshop Leader for the Times Group (NIE). 3) A Resource Person and Content Developer for Oxford University Press. 4) A Resource Person for Tamil Nadu Govt. Libraries. 5) A Mentor/Trainer for BYST (CII), and EDII. Shan's Mind Mapping and Corporate Storytelling trainings immensely help Startups and Entrepreneurs in their business development. His scripts for Tamil Nadu Govt., Medical Colleges (including Dr. M.G.R. Medical University), and Hospitals have been made into documentaries; and he has developed content and graphic designs for Odisha Govt. on GRI Sustainability Report. https://youtu.be/Zpbl6Mgdesw -- DD Podighai Interview. Sheetal is the founder-director of Genius Factory and Square Heads. Each of these organisations provide arts-and-education activities for children (3 to 10 years old), including Phonics, Maths, Arts and Crafts, Dance and Dance Composition (Choreography), Storytelling, and Event Management (specialising in Birthday Parties). The Genius Maths Program teaches maths using stories and real-life experiences, and is especially designed to teach ADHD kids. 1) Storyteller with 10 years of experience in schools and activity centers. 2) Passion for Dance -- Choreographer for annual functions in schools, competitions, and weddings. 4) Teacher, Guruskul (value education and sloka classes for children). 6) Trained in the Montessori approach to education. 7) Teacher for training children in computers. With constant innovation for betterment of education, and bringing out talent in children. All of the above can be customised. SKD is an Entrepreneur turned Storyteller. He founded an initiative called Go Green Guru, which he uses to promote Go Green awareness with children and corporates. He creates customised stories and training programs for people of all ages to promote the Go Green concept. SKD is a graduate of the seven-session Storytelling Workshop for adults conducted by Dr Eric Miller, Director, World Storytelling Institute. Training from Dr Eric polished his skills and helped him to discover the storyteller within himself. SKD conducts Storytelling Workshops for Teachers, Human Resource Professionals, Parents, Grandparents and Young Adults. He often includes Technologies and Innovations in Storytelling to increase the impact a story makes on audience members. Srividya is a founder of Story Train, which aims to encourage storytelling in a variety of genres, for people of all ages. Story Train uses storytelling for engaging, teaching, empowering, entertaining, and providing an enchanting experience of stories from across globe. 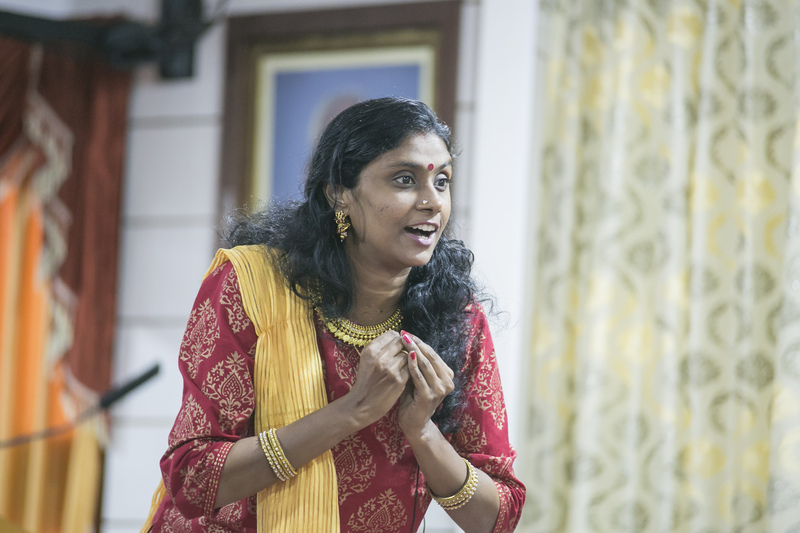 Srividya conducts customised storytelling performances and workshops for Educational Institutions, NGOs, Corporates, and other organisations (in English, Hindi, and Tamil). She also provides sessions designed to comfort and inspire people in their times of need and distress. With more than 10 years of experience in HR leadership, Corporate Social Responsibility (Tamil Nadu TCS Adult Literacy Program), Training, Theatre Acting, Family and Child Welfare, and Writing, Srividya chose to follow her passion for storytelling in 2016. 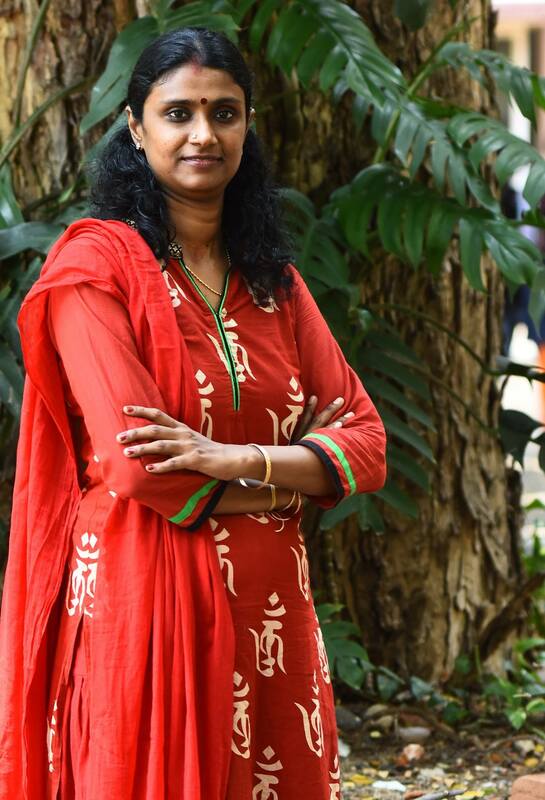 Since then, she has been a member of the Indian Storytelling Network, and has contributed actively to the development of storytelling in Chennai. She has performed for Chennai Storytelling Festival and World Storytelling Day, and does regular sessions for Government libraries in Ashok Nagar, Villivakkam, ACL, and elsewhere. Her sessions at Bookworms Library in KK Nagar are much in demand. Twice she has been featured on Podhigai's (Doordarshan's Tamil Channel's) series of programs on storytelling. She has also performed for Hello FM (Layasa Layasa Golu Special program), and All India Radio (Storytelling for children). She has been featured in Indian Express, including under the "God and Me" column in 2017. In the future, Srividya seeks to reach as many people as possible -- to share stories with them, and to facilitate them sharing stories with each other. Srividya's aim is to go beyond geographical boundaries, addressing local, national, and global issues through stories and storytelling. She would like her Story Train to be filled with passengers and their stories. In these ways, she is hoping she might have a positive impact on people's lives and the world at large. An article about Srividya is here (on a leading storytelling website). A video recording of Srividya telling her original story, "A Story of Air", is here. This is an example of using Storytelling to teach Science. An audio recording of Srividya telling the story, "Seeds of Success" (in English), is here. An audio recording of Srividya telling a motivational story for young people (in Hindi) is here. Photo 1. Photo 2. Photo 3. Subha is a Software Engineer turned Storyteller. What started as a passion after the arrival of her daughter, has turned into a profession. All was possible after her training with the World Storytelling Institute, and courses with Mr. Mohan Krishnan and Mrs. Lavanya Srinivas. Subha has also earned a Montessori Assistant certification from Association Montessori Internationale (AMI), Netherlands. Shuba has co-founded Kadhai Kadhaiyaam, a Storytelling group based in south Chennai, with two other Storytellers, Subha Ramanathan and Ramya Arivazhagan. Kadhai Kadhaiyaam provides Storytelling performances and training for children, teenagers, and adults. Suriya is very passionate about the environment, and conducts storytelling sessions and workshops for children on protecting the environment. She is currently working on a workshop model to recreate traditional storytelling methods with Storytrails. Over the weekends, she conducts free book-reading sessions (in both Tamil and English) for young children, which helps them to sharpen their listening skills and imaginations. By profession, Suriya is a business analyst in the banking domain. Tharani is a Software Engineer turned Storyteller for children. She enjoys connecting with children through stories, and believes this is a very effective way of communicating with children. Tharani has received training in Storytelling for children from Ashley Ramsden, founder of the International School of Storytelling, UK. She has also attended workshops conducted by the World Storytelling Institute, Chennai; and courses on Early Childhood Education from Stranmillis College, Belfast, Northern Ireland. 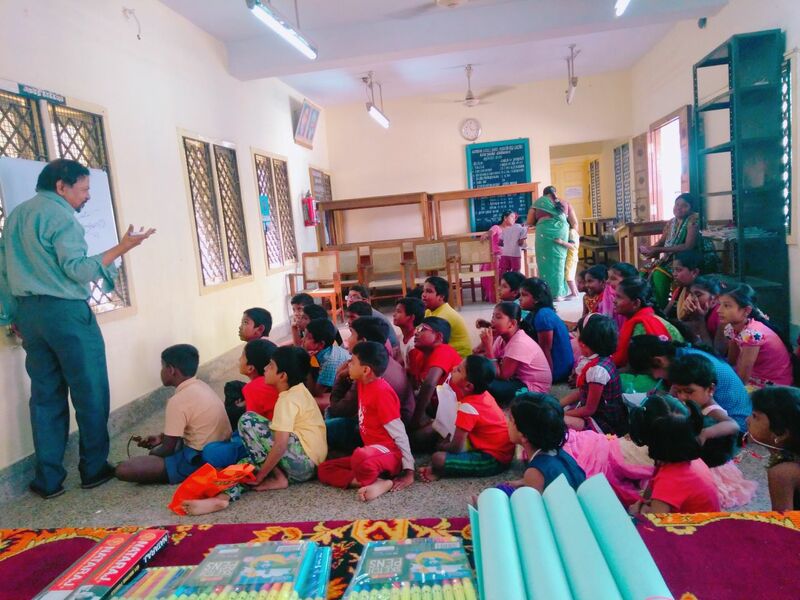 Tharani conducts weekly Storytelling sessions for children upto 8 years in the Nolambur area of Chennai. She performs and leads activities at Birthday Parties. She has conducted Storytelling sessions at a library in Anna Nagar, and at a play school in Nolambur. Vasugi is the founder-director of Madras Story Works. She has a post-graduate degree in Literature, and has trained in Storytelling with Eric Miller (World Storytelling Institute) and with Geetha Ramanujam (Kathalaya). Vasugi specializes in interactive Storytelling sessions for children. She believes that Storytelling can bring about wonderful changes in children, making them creative, wise thinkers, great speakers and problem solvers. Storytelling is an excellent method to overcome shyness, excel in public speaking and develop communication skills. 1) Storytelling sessions with arts-and-craft activities. 2) Storytelling activities at summer camps. 3) Storytelling workshops for people of all ages. 4) Storytelling competitions in schools, bookstores and children's activity centers; for children, parents, teachers and early childhood development personnel. A) 11am to 12:30pm, at Storycorner in Bookmine Library, 1, Tarapore Avenue, Harrington Road, Chetpet. B) 3:30pm to 4:30pm, at Oyster Kids, 77 / 177, Luz Church Road, Mylapore. Zarin represents the women of Chennai who are aspiring to be self-sufficient and who are taking challenges one at a time. Zarin has over 8 years of experience in the IT industry, specialising in Analytics. She has worked with multi-national corporations such as Tata Consultancy Services (TCS), Accenture, and Cognizant Technology Solutions (CTS). She is currently pursuing a PhD in Analytics, and is looking to venture into Educational Analytics in the future. Zarin began storytelling as an amateur for children at home. She took a step further to enroll at the Word Storytelling Institute, Chennai, directed by Dr. Eric Miller. She is the first person to be certified as a "Professional Storyteller" by the World Storytelling Institute. In addition to being a professional Storyteller, Zarin is also a trained Artist. 1) Teaching English to Young Learners (TEYL). 3) A full range of Drawing (still life, landscape, and portrait), Painting, and Crafts. No.1, Tarapore Avenue, Harrington Road, Chetput. Storytelling performances (and activities) for children. at Oyster Kids, Luz Church Road, Mylapore. At Fables n Tales, No.1, Nithyanandam Street, VGN Mahalakshmi Nagar, Perumalagaram, Tiruverkadu, Chennai, 600 077. Admission: Rs 100. At Sastha Tution Centre, #270, Selvavinayagar Koil St, Co-operative Nagar, Tiruverkadu, Chennai, 600 077. Admission: Rs 150. For details about both days, please contact Fables N Tales, which is directed by Banumathy. Every 1st and 3rd Saturday. Story Voyage -- Children are taken to different destinations, such as museums, marine aquariums, zoos, and planetariums. The voyage starts and ends in Royapettah. Each child must be accompanied by an adult. The fee is Rs 500 per person -- this includes the bus ride, tickets (if any), snacks, and juice. For further details, please contact Priti Sudarsan, 99627 14870. The Narrative (directed by Indu Divya) hosts monthly open-mic sessions of "Storytelling about Personal Experiences, by and for adults". For details, please call 98407 12328. Storytelling is at the core of all services offered by The Narrative, including training, coaching, and content development. World Storytelling Institute (directed by Eric Miller) also hosts monthly open-mic sessions of "Storytelling by and for Adults". These sessions occur on the 1st Monday of each month at 6pm, at Cafe Coffee Day Square, on Khader Nawaz Khan Road, Nungambakkam. Additional info about these sessions (including links to articles about them) is here. A) Storytelling Performances with Activities for Children, Saturdays, 11am-12:30pm, in Chetput. B) Storytelling Coaching for Children, Saturdays 4-5pm, in Mylapore. C) Storytelling Coaching for Children, Thursdays 4-5pm, in Aminjikarai. For details, please click here, and call 98401 18590. Tale Spin (directed by Asha Sampath) presents Storytelling performances (and activities) for children. Every 2nd Saturday of the month, at 5pm. At Odyssey, Adyar. For additional info, please click here and call Asha at 98408 33953. Eloquens (directed by Sandhya Ruban) frequently presents Storytelling Performances and Classes for -- and Dramatic Productions by -- Children. Based in Ayanavaram. For details, please click here and call 98401 77215. Once Upon a Time (directed by Kavitha Thyagarajan and Debjani Bhaduri) frequently presents Storytellling Performances and Classes for Children, in R.A. Puram. For details, please click here and call 99400 36390. Fables N Tales (directed by Banumathy) offers Storytelling performances, with activities, for children. A) Saturdays, 10:30am to 12 Noon, at Fables n Tales, No.1, Nithyanandam Street, VGN Mahalakshmi Nagar, Perumalagaram, Tiruverkadu, Chennai, 600 077. Admission is Rs 100. B) Saturdays, 4pm to 5:30pm, at Virutcham Kidz Castle, 5069, Z Block, 12th Street (near Chinmaya School), Anna Nagar, Chennai. C) Sundays, 10:30am to 11:30am, at Sastha Tution Centre, #270, Selvavinayagar Koil St, Co-operative Nagar, Tiruverkadu, Chennai, 600 077. Admission is Rs 150. For additional info, please contact Fables N Tales: Stories for the Soul, at 80560 50606. 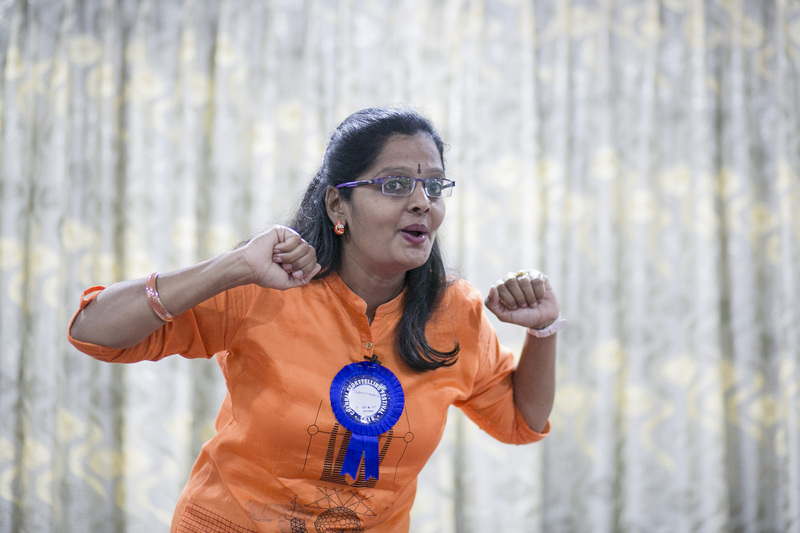 Katha Kamamishu (directed by Lavanya Srinivas) offers Storytelling Workshops and Performances at numerous locations, including the Gandhinagar Club, in Adyar. Katha Kamamishu especially conducts Storytelling Workshops for pre-primary and primary school teachers. The "Story Mantra" series of Workshops occur in three levels: introductory, basic and advanced. The Workshops are customised and conducted with a restricted batch size to ensure effective communication and training, with a special focus on the specific needs and challenges of each individual teacher. For additional info, please click here, and contact Lavanya Srinivas, at 98844 72301, laavanyasrinivas@gmail.com . Pumpkin Chariot is a Storytelling unit founded by Sai Pradeep Indhirran. Sai is the Storyteller. Pumpkin Chariot helps children learn a variety of aspects of communication involving values and morals and ranging from conversational speech to stage speech, and from team skills to leadership skills. The method is to blend storytelling with NLP (Neuro Linguistic Programming) and TA (Transaction Analysis) techniques. Sa Buu 3 Kids Play School, Navaneethammal Street (adjacent to Shoba Kalyana Mandapam in Arunachalam Road), Saligramam. Yoyos Activity Center, K K Nagar. Day and Time: Sundays 10am . Genius Factory, directed by Sheetal Rayathatha, provides arts-and-education activities for children, including Phonics, Maths, Arts and Crafts, Dance and Dance Composition (Choreography), Storytelling, and Event Management (specialising in Birthday Parties). For details, please click here and here, and call 98400 91290. Kathalaya (directed by Geeta Ramanujam), based in Bangalore, is developing a "Story Space" in Chennai. For info, please contact: 080 2668 9856, kathalaya@gmail.com . Kadhai Kadhaiyaam (KK) is a Storytelling group based in south Chennai. KK believes in inspiring adults and children through stories. KK conducts monthly sessions in a Montessori school in Velachery, and also in other activity centers, libraries, and schools by request. KK was co-founded and is directed by three Storytellers: Subha Hariharamahadevan, Ramya Arivazhagan, and Subha Ramanathan. Mohan Krishnan is mentor of KK. For additional info, please call 90032 53726, and email to kadhaikadhaiyaam@gmail.com . The Chennai Storytelling Association (CSA) has approx 320 members. Most CSA members have conducted and/or attended multi-session WSI Storytelling Workshops. The CSA hold monthly meetings at 6pm on the 1st Monday of each month at Cafe Coffee Day Square (on Khader Nawaz Khan Road), before the storytelling by and for adults sessions there. Info about these sessions is here. For additional info about the CSA, please click here and call 98403 94282. World Storytelling Institute (directed by Eric Miller) offers 7-session Storytelling Workshops for adults, on Sundays, 10am-12noon, near Nungambakkam High Road. Info is here. WSI also presents a monthly "Storytelling by-and-for Adults" open-mic event. This occurs on the 1st Monday of each month at 6pm, at Cafe Coffee Day Square, on Khader Nawaz Khan Road, Nungambakkam. Additional info about these events (including links to articles about them) is here.